Washington, DC-based media production and live events company, Quince Imaging is concluding its 20th year in business with an upgraded corporate headquarters to accommodate its rapidly growing staff and service offerings. The company’s flagship work is 3D projection imaging and if you’ve attended a professional sporting event recently, chances are you’ve seen some of Quince’s work. Bill DuLaney, business development manager, has watched the digital signage industry grow throughout the past 25 years. He said the industry, particularly projection, is in the middle of a massive sea change that is putting the technology on-trend with what consumers want – experiential, entertaining, immersive experiences. In fact, according to a market report from Technavio, the projector market (globally) is expected to be in excess of $132 billion in 2019, growing at a CAGR of more than 18 percent. Projection offers “the highest resolution you can achieve,” DuLaney says, because there is no limit on pixels – you can continue to add projectors, and servers to fit whatever size or shape you’re aiming for. Quince Imaging is seeing some trends emerge within its business, such as retailers using projection imaging to create storefront windows or illuminating a certain area of their store, or projecting rotating outfits on a mannequin. In sporting arenas, teams are going for the “wow factor” at every turn and the ROI comes with the fan engagement these projections are yielding on social media. “People like it because of the engagement. The number of eyeballs on these displays, not only in the venue or facility but also on TV, and streaming sites, all of which translates to hits on social media. Engagement is proven ROI,” DuLaney said. He adds that the market has changed in that brands are looking for new ways to present and differentiate themselves. “Experiential is a hot trend and rightly so, whether you’re a brand or an agency. This is a proven way to hit certain demographics through unique, fun and engaging types of technologies. It could be purely immersive and interactive, bringing in the power of personal and shared experiences, augmented reality, or a combination of each.” he said. Projection is an ideal way to achieve an immersive digital experience because there are no seams or bezels. The improvement of the technology is enabling projection to become a better experience as well. Both the image quality by virtue of new video standards (HDR, 4k, 8k) and the server technology have made strides in the past few years alone. Real-time rendering is another significant advancement, DuLaney said. Clients can preview what the project is going to look like before it goes live. “If you’re in a stadium and you have a touchdown catch, you can replay that back in slow motion on all of the digital signs immediately and have it streamed simultaneously. We are rendering high resolution video files in real time. We don’t have to wait anymore,” DuLaney said. He also notes other trends quickly coming down the pike in projection and digital signage, notably augmented reality and hologram technology. Lowe’s and Home Depot, for example, are working on AR where customers can use photos of their dining rooms and pull the kind of style they’re looking for to pre-model in a 3D environment. Though Quince is positioned well amidst all of these changes, challenges remain in keeping up with the swift pace of technology advancements. Though Quince Imaging got its start 20 years ago specializing in high-end events, it has found its sweet spot in sporting arenas. To illuminate an arena, it takes anywhere from eight to 12 top-of-the-line projectors and lenses. There is also the mounting, the electrical, signal flow process, servers, programming, and then adding in custom 3D animations. The price tag isn’t cheap, but the ROI speaks for itself. Teams are using signage to sell not only ads but also tickets. DuLaney said the market will continue to grow because sports is an ever-evolving marketing machine, always in search of new and competitive ways to reach customers. “Once the Cowboys or Manchester United do it, everyone else will want to do it, albeit better” he said. Because of this growth, Quince keeps redefining its successful case studies. The United Center in Chicago, for example, posed a structural and mounting challenge for projection because of its existing roof structure and the huge video boards that affect the angle of the projections. Quince’s engineering team came up with a solution to do one system for two sports – the NBA’s Bulls and the NHL’s Blackhawks – including the content. “Clients now see the value of a company that understands this technology not just from the science/engineering part, but also the creative side. The United Center project is one we can really hang our hat on,” DuLaney said. Another of Quince’s milestone achievements was the viral success of the Cleveland Cavaliers pregame court projection at the ceremony honoring the jersey retirement of Zydrunas Ilgauskas in 2014. 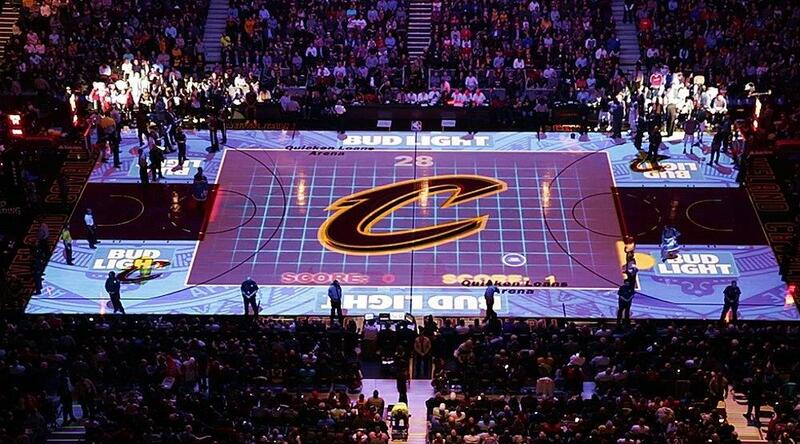 Since then, Quince went on to permanently install the Cavs 3D projection system, as well as develop creative content for major events and projects, including the “Cavs Arcade.” Quince Imaging was selected to design and adapt a full-court projection reminiscent of the classic arcade game Pong. Cable news channels picked up footage from Ilgauskas jersey retirement and it received 2 million + hits over a couple of weeks. Since, Quince and the Cavs have worked together extensively to coordinate pre-game shows, halftime shows, time-out entertainment and more. View the Cavs arcade here. View Quince’s MARS Petcare video project.